These two objects [EAX.3035 & EA1978.1765] are of a type usually termed ‘Gombroon ware’. Gombroon was the old name for the port of Bandar Abbas. Here the Dutch East India Company had a trading-station, and from Gombroon quantities of Persian soft-paste porcelain were shipped to Europe. Although the bulk of exported ceramics were probably blue and white, the term ‘Gombroon ware’ is helpful in distinguishing this group, in which white so obviously dominates. Both these objects illustrate a relatively plain aesthetic which is unusual in Islamic ceramics. 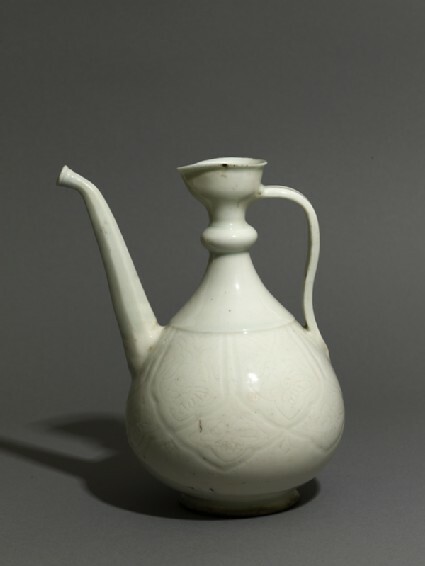 The origin of the shape [EAX.3035] is uncertain, but the most likely explanation is that it derives from late seventeenth – early eighteenth century Famille Verte Chinese ewers, of which there are two fines examples in the Topkapi Saray in Istanbul. Such ewers were themselves probably copied from Islamic metalwork prototypes. Moulded designs on blue and white could well have provided the inspiration for the underglaze incised patterning. The bowl [EA1978.1765] on the other hand shows more local taste. The form, with a moulded domical centre, is part of an age-old tradition of phialae, small bowls used for pouring water, known from Greek and Archaemenid examples, and still used in the Islamic world today. The piercing of the sides of the bowl is probably the Persian potter’s attempt to emulate the translucency of Chinese porcelain and may well be the source of the rice-pattern used by the Chinese potters of the eighteenth and nineteenth century. 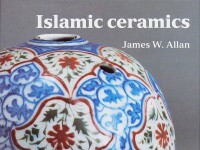 The three stems of trefoils illustrate the typical desire of the Islamic potter for colour and design, here exquisitely rendered, and carefully balanced by the groups of black dots on the rim.